Killer Events. Unique Style. Unforgettable. At Hello Productions, we do more than just plan events – we also handle marketing and promotions for companies and their events. We are often asked to design and print flyers, signs, banners and other marketing pieces. With online and in-store print services, it is easier than ever to get the word out. Here are some of our favorite new ideas to promote your company or next event. And keep reading for five free ways to promote your business or event! 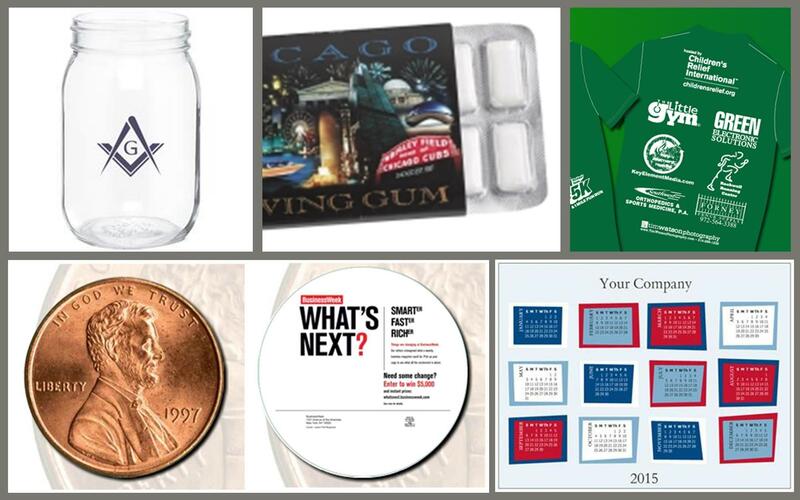 Clockwise from top left: Mason Jars, Custom Gum, Tshirt Sponsor, Calendar Magnet and Die Cut Postcard. Mason jars are in right now so they’re the perfect way to have your logo be seen. These 16 oz mason jars with threaded tops (lids optional) are available from Adco Marketing. Put your name or logo on a 12-piece sugar-free gum pack, like the one available through Staples. Magnets, such as calendar magnets from Vistaprint, are a fun giveaway at trade shows or just to thank customers (and encourage new business). If you are going to use them to promote your company, make sure to include your name, phone number, website and hours (if applicable). We’ve all seen business postcards that come in the mail. Some catch our eye and some don’t. Make sure yours do with these unique die cut postcards from ShipShapes. Send these to new customers to encourage new business, as well as existing customers, to invite them to a special event or send them a reminder. Whether it’s a 5k walk/run event or a beer tasting, you can give your company exposure by being a sponsor. Make sure you submit an attention-grabbing logo for their materials and don’t forget to advertise the event on your own website, blog or Facebook page. You can also hold an event and get other business partners to sponsor. Advertise their logos on tshirts, like the one above from Rockwell. Promotions don’t have to be pricey! Here are five FREE ways to promote your business. Set up an online presence. Promote your business using Google Plus, Facebook, Twitter and Instagram. Set up a free website. Sites such as WordPress.com have themes for all types of businesses. Write an article for submission to a local newspaper, magazine, blog, and/or website. Include new business (such as new locations or employees), events, and other topics that demonstrate your expertise in that particular field. You can also offer to be a speaker at a conference, community event, or local business group. Network! Take advantage of any local or online networking opportunities to share information about your business and increase your potential client list. Hold a contest to collect Facebook “likes” or emails for your newsletter distribution. You can offer a product or service from your business, or partner with another local business that may be willing to donate something in exchange for the exposure. Looking for more help promoting your business? Give Hello Productions a call today (412-298-7333)! If you would like to subscribe to our monthly eNewsletter, please click on the link below to submit your email address.